Regardless of which angle you look at it from, age 21 is amazing! So if you happen to know someone who just turned 21, don’t let their Big Day get to an end without brightening it with a fabulous birthday message. And thankfully, our collection of well composed 21st Birthday Wishes below can help you do just that. What’s the definition of true freedom? 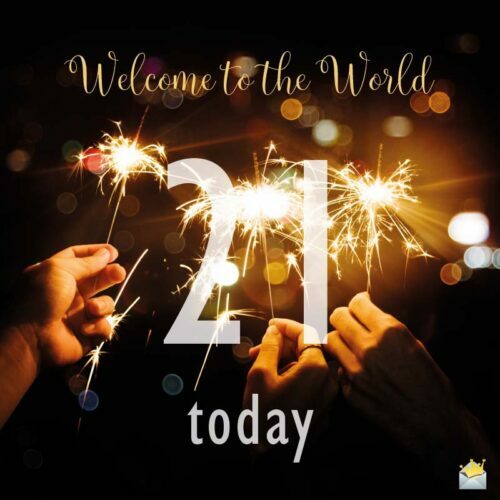 It is turning 21! Have a super 21st birthday celebration! You’ve finally walked into the world of real adulthood. I hope you enjoy every beautiful thing that resides in that fabulously exciting world. Happy 21st birthday! Hurrah! Your days of moving around town with a fake ID are finally over! Happy 21st birthday! The benefits of turning 21 are exciting and endless. I hope you enjoy every single one of them. Wishing you a ridiculously fun 21st birthday! Welcome to age 21 – the most fun age in the universe! Happy birthday! Happy 21st birthday! You’ve finally made it through a fourth of your life. Enjoy the remaining three fourths to the max! Happy 21st birthday! May your skies always shine with the beautiful rays of the sun – today and all the days of your journey on this planet. Happy birthday! Make sure you don’t miss all the fun that accompanies 21. Wishing you all the joy and blessings your world can contain as you mark your 21st birthday. Have a great one! Welcome to the world. 21 today! Happy birthday, buddy, and congratulations on turning awesome 21 today! May this beautiful age be the beginning of several decades of happiness and great accomplishments for you. Wishing an unforgettably joyful 21st birthday to one of the most wonderful people on earth. You are undoubtedly the most gorgeous 21-year-old in the world. I hope you have yourself a super-duper exciting 21st birthday bash! The reason why these past few years my world has been more beautiful than it has ever been is because you live in it. You’re an angel to me, my dear. Happy 21st birthday! 21 looks absolutely beautiful on you. May your beauty be as everlasting as the heavens. Happy 21st birthday! On your 21st birthday, I wish you the greatest treasure of life. True happiness. May God give you an unlimited supply of that. Happy birthday, my dear. Your 21st year on this planet is certainly a momentous occasion in your life. I hope it brings you all the joy your beautiful heart deserves. Happy 21st birthday! Hurrah! It’s the 21st anniversary of your arrival into this world! Wishing you nothing short of a fantastic blast as you commemorate this special day! One is never truly free until he/she has turned 21. Happy 21st birthday! Hearty congratulations to you on hitting this great milestone of life. Have a beautiful 21st birthday, year and life. Nothing makes me happier than seeing you turn 21 so gracefully. May the bright smile God has blessed you with today never leave your face. Happy birthday! May your 21st birthday open the door to your prosperity. Happy 21st birthday! Being such a wonderful friend to me, you deserve nothing but the finest…on your 21st birthday and on every blessed day of your existence. I pray and hope your 21st birthday is crammed with the guiltiest of pleasures! Have a fabulous day! Your 21st anniversary gives me the perfect opportunity to tell how blessed I feel to have a wonderful friend and angel like you by my side. May your Big Day be so fabulous that you remember it forever. May the force be with you as you celebrate 21 years of existence on planet Earth! Happy 21st birthday! Hoping you enjoy to the fullest all the amazing privileges and benefits that this amazing age has to offer. May God hear all your birthday wishes and make them come true. Happy 21st birthday! Here’s wishing you a mighty ocean of fun on your 21st birthday. May all things good and beautiful find their way to you wherever you may go. Happy 21st Birthday. You’re an adult now! Wishing you an incredibly happy 21st birthday! May every blessed day of your life gift you heavenly bliss. Yay! You’ve grabbed the freedom you have been looking for at last! So throw away all your fake IDs and let’s paint this town red! Wishing you a very exciting life as a 21-year-old! Happy 21st birthday! You are not only the youngest 21-year-old in the world but you are also the coolest. May God never stop decorating your life. On your 21st birthday, I only have one message for you. Never stop being proud of who you are, for you are amazing. May beauty and blessings surround you forever. For as long as the sun shines, may your heart know peace and true happiness. Happy 21st birthday! May this 21st birthday you celebrate today bless you with riches, contentment and happiness beyond your wildest imagination. 21 is no ordinary milestone. So from the bottom of my heart, I wish you a fabulously happy 21st birthday. May this landmark celebration lead you to greater heights in life. May the happy moments of your life be as countless as the sands upon the surface of this earth. Happy 21st birthday! I always praise the skies for bringing you to me. Happy 21st birthday, my darling. Your days of being restrained are now in the past. So here is a toast to your new-found liberty to have all the fun in the world! Happy 21st birthday! 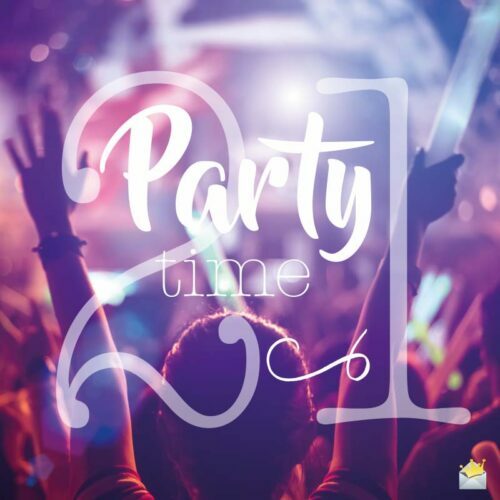 Now that you’ve turned 21, you’ll never miss out on all those amazing 21+ concerts! Get ready to have the fun of your life. Happy birthday! Life is too short, so enjoy all the fun being 21 has to offer. Happy 21st birthday! Happy 21st birthday! Never feel sad about growing older, for being able to grow older and enjoy life is a privilege many don’t get to enjoy. Age 21 is undoubtedly the bomb! Relax and enjoy the exciting magic this outstanding age comes with. Happy 21st birthday! Wishing a glorious 21st birthday to an amazing individual! The happiness and fun that inhabit this age are remarkable. Enjoy every bit of this awesome life you’ve been blessed with. Happy 21st birthday! You, my friend, are blessed beyond words to see this exceptional age. Count your blessings and have a colorful celebration! Congratulations! Now you can enjoy all the booze you want without the assistance of a fake ID. Happy 21st birthday! Hoping your 21st year as a citizen of planet earth marks the start of the most colorful and prosperous years of your life. Happy 21st birthday!